We were so blessed to have the assistance of Pack for a Purpose and its founder, Rebecca, as we prepared for our upcoming trip to Africa. Going to Africa was a dream of mine for so long, and I had put away an article about Pack for a Purpose in my “someday travel to Africa” folder. Imagine my surprise when, in response to an e-mail asking for information as we were traveling to Kenya and Rwanda, Rebecca called me! 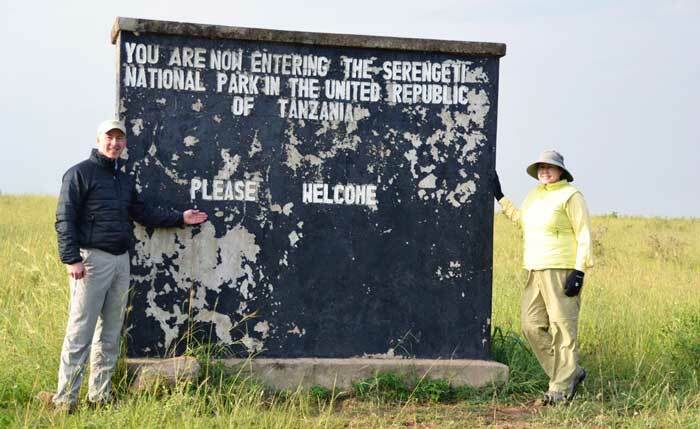 From the start, Rebecca connected with me with the organizations that mattered to us (education and animals) and were near the safari camps where we were staying. We quickly accumulated the materials that were requested by the organizations—having the lists on the website made it super easy! We contributed to an orphanage/school in the Mara in Kenya, the rhino orphanage at Lewa, and a school in Lewa. Additionally, the school in Lewa let me know that there were textbooks for sale, if I cared to purchase some and meet them at the school with our donations. That sounded like an excellent way to round out our donation, so we bought 40 textbooks for the school. As we got closer to our trip, we were having so much fun accumulating the items. We had donations from friends and family of gently used children’s clothes. The rhino orphanage needed men’s tennis shoes for the guards… so we got to clean out a closet, as well! Some things we purchased: Costco has great deals on band-aids and the feminine supplies the girls’ school needed. On the day of our trip, we packed our materials in surplus bags purchased at the army-navy store, and off we went to the airport! Everyone handling the bags seemed as excited as us when we told them our reason was to help out schools and a rhino orphanage! Other than getting the bags out to our car, someone was always there to help us. Once we landed in Africa, our tour operator, Cheli & Peacock, deftly handled the bags, and they met us at our camps for distribution. We had an AMAZING adventure in Africa. 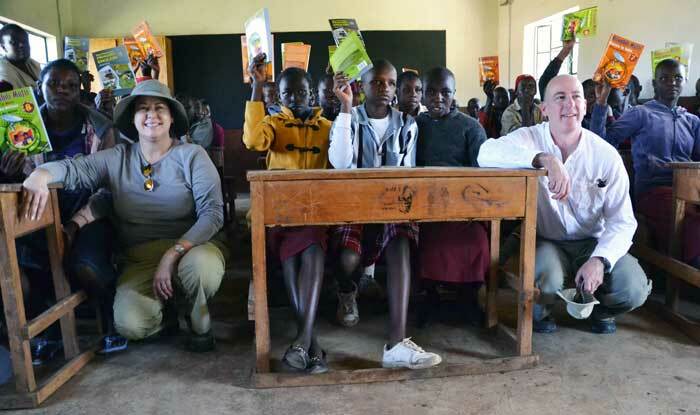 Two of our most special moments were at the school and rhino orphanage at Lewa. The delight of the children in receiving our gifts and textbooks was magical. Although the schools in Kenya were not in session due to a teacher strike, because our trip had been planned, the principal, three teachers and about 50 students came in to meet us and thank us for our donation. The photos do not demonstrate adequately the joy of these children—the African children put on very serious and dignified faces for their photos. Minutes before the photo was taken, there was laughter, joy, singing, dancing… and sheer delight! It was a magical, and a memory I will treasure my whole life. The rhino orphanage was amazing. These dedicated men and animal lovers stay with the rhinos 24 hours a day, 365 days a year, in shifts, keeping them healthy, happy, and safe. The babies get to go out and eat during the day, with their dedicated rangers to protect them, and then they are inside in a safe area at night, and the rangers even sleep in the area where the baby rhinos are! We got to pet, love on, and learn so much about the rhino babies, who are the victims of their mothers being poached. Rhinos are such awesome creatures… very gently and loving. Knowing of their scarcity in this world made our contribution even more magical. Our trip was amazing, Africa is glorious, and we will return as soon as we are able. 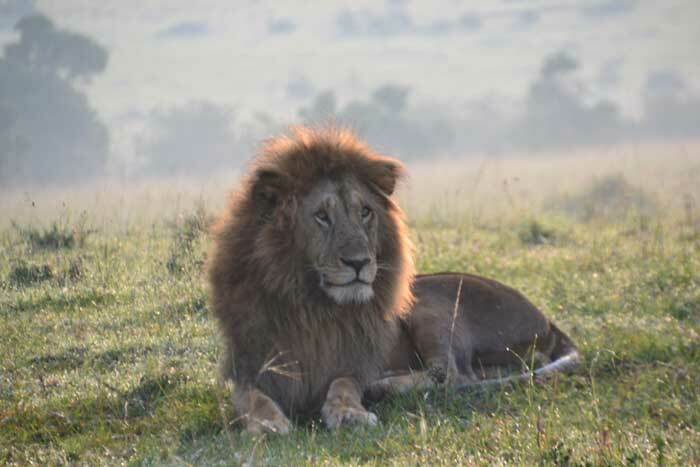 I know, in my heart of hearts, that Africa gave us such a wonderful trip and time (we saw the big five within two days of being in Kenya… astounding!) because we took some time and effort to give to Africa. Do not be afraid—the countries are safe, the animals are amazing, and if you are able to travel to Africa, you should go, and remember to Pack for a Purpose so Africa will show off its finest for you!